State of Maine Comb Back Windsor Rocker with the wonderful paint decoration that is unique to furniture from that state. The chair is in excellent original condition with vibrant decoration. Very nicely shaped seat and also very comfortable which is not always true of rocking chairs. 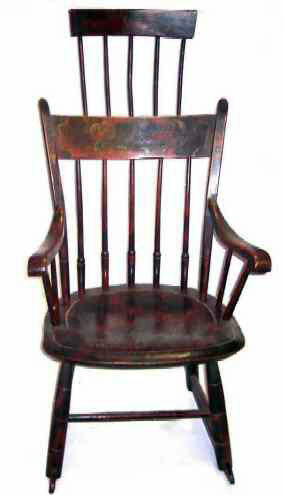 The combination of this rare form as well as the paint decoration makes this rocker a very exceptional piece indeed.